This cake is perfect! I’ve made a lot of cakes in my time, almost always from boxes. 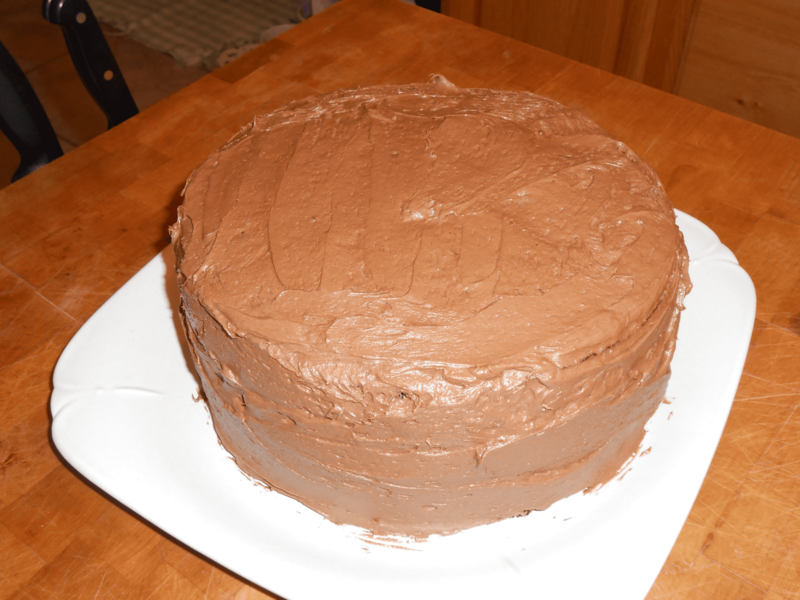 Over the last few years, I’ve searched for perfect chocolate and vanilla cake recipes, and this chocolate cake was my recent discovery. My former attempts have either been dry, or the layers fall in the middle. The January/February 2013 issue of Food Network Magazine featured two basic cake recipes. From these, bakers can add flavors, fillings and frostings to make a special cake for any occasion. 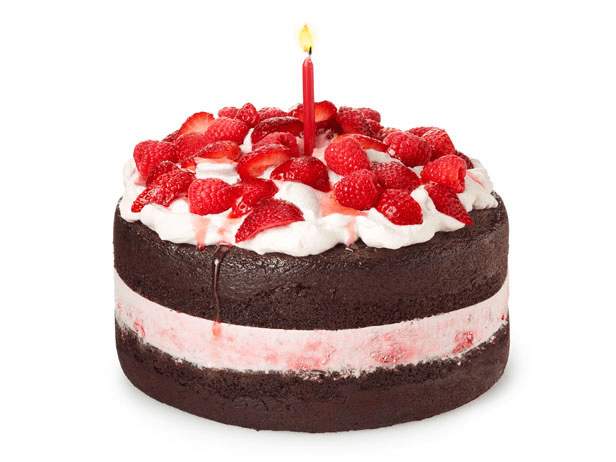 And FN did just that – they printed recipes for 12 unique birthday cakes, one for each month. 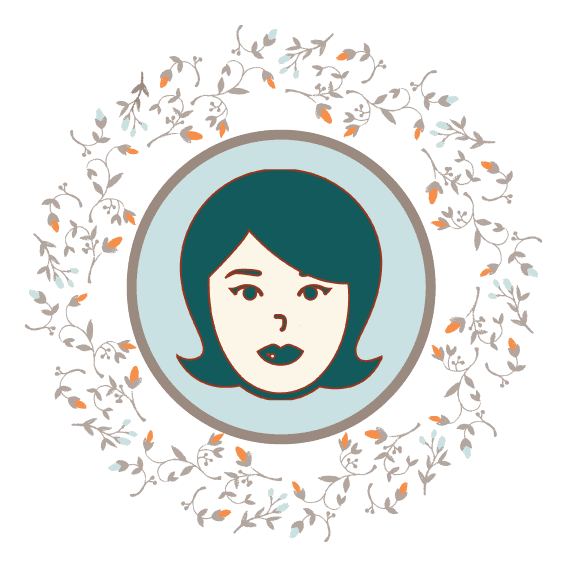 If you’re looking for inspiration, I would encourage you to visit the site. This is the cake my grandson, Quinten, eyed as he was looking through the magazine. Isn’t this pretty? I was also excited to find the chocolate cake recipe calls for sour cream. I love sour cream, buttermilk or yogurt in cake batters. They taste richer to me, and produce a moister cake. So, I’m going to copy the chocolate recipe with a link to the Food Network article (above). These baking strips from Wilton are a blessing for anyone who wants their cake layers to be flat. You can find them anywhere Wilton cake supplies are sold, and they come in different sizes. The package I bought can be wrapped around 8″, 9″, or 10″ cake pans. I haven’t tried the strips with square cake pans, but I imagine they would work wonderfully there, too. 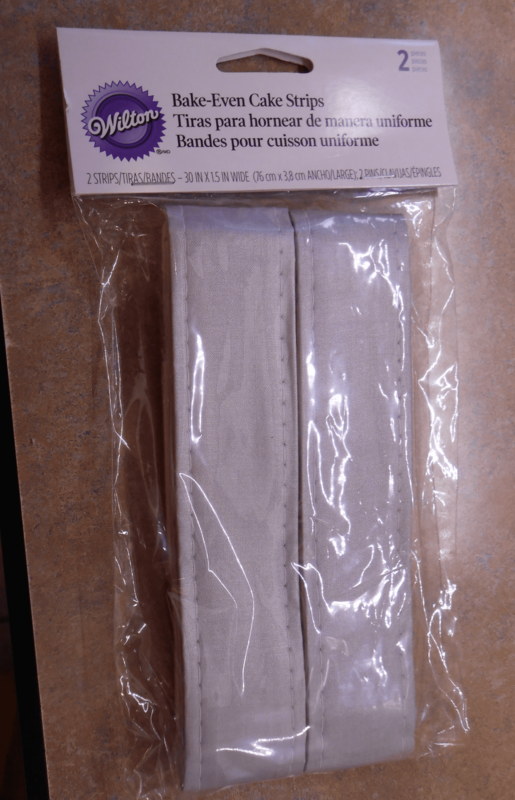 Another package of strips comes in four different sizes – one of which for a 9″ x 13″ cake. All you do is soak the strips in water to completely saturate – 10-15 minutes. Then run a strip between your thumb and forefinger, and wrap it around the outside of the cake pan, then secure it with the T-shaped pin included. I can’t tell you how impressed with the flatness of the baked layers. I figure they work by keeping the outside of the cake pan cooler, so it bakes at the same rate as the batter in the middle of the pan. Preheat your oven to 350° F. Grease your pans and line the bottoms with parchment paper. I cut the parchment circles, spray the pans with cooking spray or coat with vegetable shortening, and use a scrapper to make sure the parchment adheres to the bottom of the pans. See how the parchment lies flat without any air bubbles? Another reason I like this recipe is that it calls for Dutch processed cocoa powder, which I most always have on hand. It’s so much easier to use than melting baking chocolate. Yes, I need to work on my photography – all purpose flour and granulated sugar are in the background. And you can wrap the cooled layers in plastic wrap and freeze them for up to 2 weeks. Be sure to thaw them before filling or frosting. Whisk the cocoa powder and 1 1/2 cups of boiling water in a medium bowl until smooth. Set aside. Whisk the flour, sugar, baking powder, baking soda and salt into a large mixing bowl until combined. That’s right, we don’t cream butter or oil with the sugar. Add the eggs, vegetable oil, sour cream, and vanilla to the mixing bowl. (Now this is where you can substitute coffee granules or orange extract or mint extract to change the flavor. I would still add one teaspoonful of the vanilla then a teaspoonful or so of one of the other flavorings.) Mix these ingredients on medium speed of your mixer until it is smooth. About a minute or so. Add Cocoa Mixture in a slow steady stream until just combined. Reduce mixer speed to low, and slowly pour the cocoa mixture in a steady stream until just combined. In fact, you might want to under mix, and finish putting it together with a spatula. That way you won’t over mix the dry and wet ingredients, which in my experience, leads to a tough cake. If you’re using them, now is the time to drain the Bake-Even strips and wrap them around the prepared pans. Divide the batter between the two prepared cake pans. 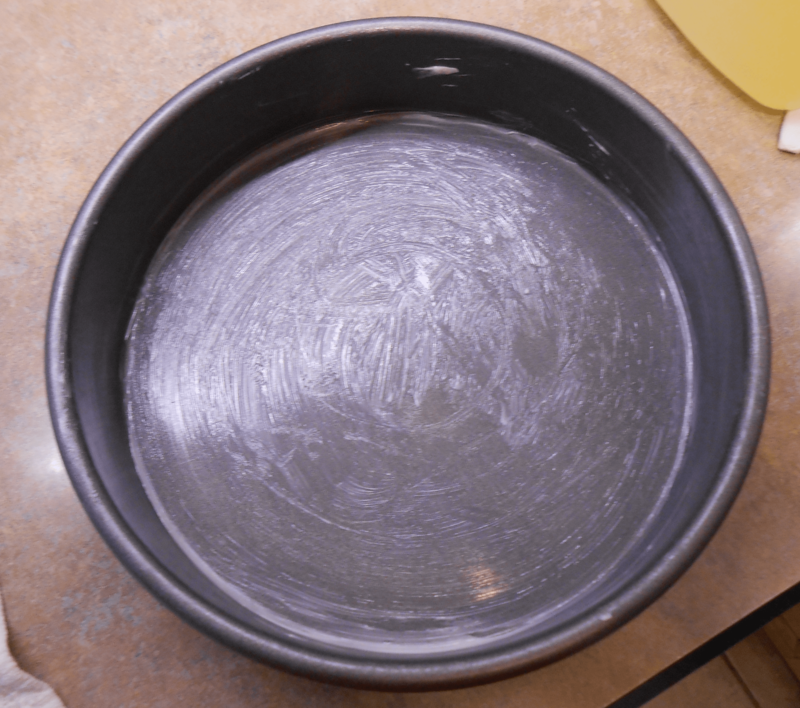 Gently tap the pans on a flat surface, so the batter will settle. Bake for 30 to 40 minutes, or until a toothpick inserted into the center of the layer comes out clean. Remove the pans from the oven, put on cooling racks, and leave to cool for 10 minutes. Then, turn the cakes out on the cooling racks, remove from the pans, and let them cook completely. See how nice and flat the tops of the cakes turned out? I really love those baking strips! Beat together the butter, marshmallow cream, and vanilla (flavorings). Reduce mixer speed to low and gradually add cocoa powder and powdered sugar – be sure speed is slow enough so cocoa and powdered sugar doesn’t fly all over the place. Add milk one teaspoon at a time, until desired spreading consistency is reached.